Thanks for your input, it certainly would have been easier to just flash the ECU than the manual hit and miss adjustments I had to make using the Series 3.5 Dobeck. Like I mentioned earlier in the thread, they make a Series 4 now for the FZ-07 which comes with a wide band oxygen sensor that allows you to set various A/F ratios which the controller uses as set points under the three riding modes of cruise, acceleration and full throttle. 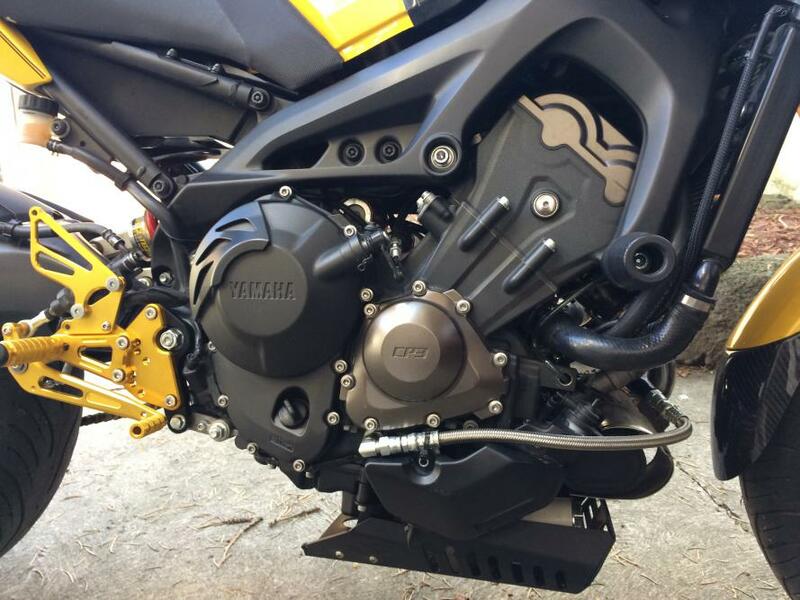 Having the ability to set different A/F ratios is a big plus and I'm looking forward to installing a Series 4 when they make one for the FZ-09. 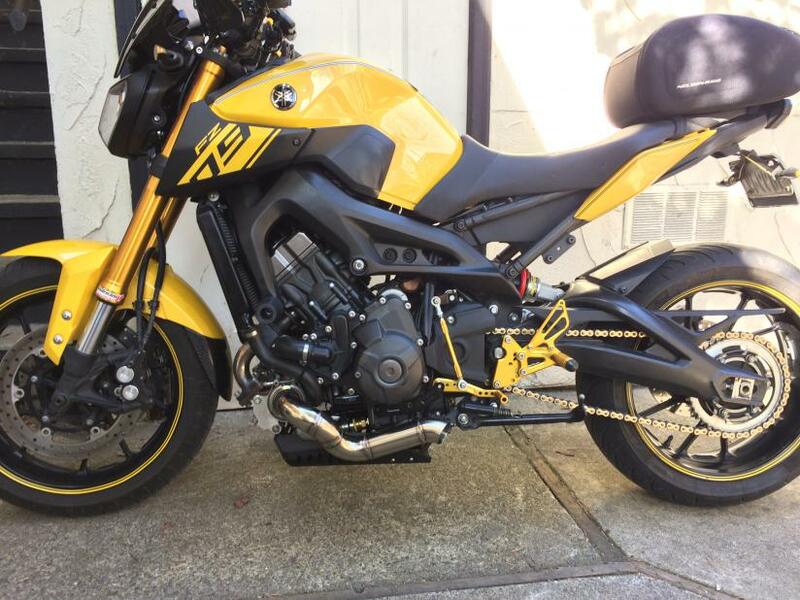 In the meantime, I'm tempted to do an FZ-07 turbo as my next project with around 100 hp. Also, it took a while to wrap my head around relative boost numbers for different sized turbos. Think of it in terms of the centrifugal air compressor performance curve (turbo map). Boost pressure is one variable and flow rate the other. Made a few improvements to the build and now have about 2000 miles on it. Besides the rear sets and stainless turbo pipe, I installed a scavenger pump for the oil return line and routed the supply from a different tap with a check valve just before the bearing. This keeps the bearing oil contained now. An unexpected benefit from the project was improved handling now that the center of gravity has moved forward and down. It's very noticeable on turn-in and the lack of exhaust equipment behind the engine also gives the swingarm a cleaner look. I'm only using about 5 psi boost as measured in the airbox and it runs perfect. When the opportunity arises I'll do a dyno run and see what it measures. It feels like a liter bike in middleweight clothing. Morten and meinschaft like this. Just wanted to update this thread with a picture of the new turbo pipe (6th generation by the way) which has better ground clearance, power and sound. The bearing oil scavenger pump that everyone uses to return the bearing oil was also dumped in favor of gravity drain that had to be specifically designed for this bike. Now I have absolutely no residual oil in the bearing cavity (which makes the engine smoke on start-up) and it saves a lot of weight and complexity besides the annoying noise it made. This becoming an interesting kit. Any plans to build a more efficient exhaust manifold? Yes, I have a builder working on that. The square one I made was a prototype for this proof of concept. Without the turbo, it made surprising good low end torque that was probably better than stock, but sucked above 5000 rpm. Any chance we could get a youtube video of the sound and acceleration? This looks really clean. I'll see what I can do to post something on youtube in the future. Presently, I just returned from a 350 mile trip and can share a few things noted from that. Usable power starts to build at 3500rpm. I'm measuring about 2 psi of differential pressure between the compressor discharge and the airbox at 5 psig airbox pressure which seems to be the practical limit of boost for this set-up. Although power and acceleration obviously increases as revs increase, it's not the violent surge you would normally get on a bike with a larger turbo, but then again, this is a mild turbo build. I really like the partial throttle response. Although not measurable, boost actually starts building lower than 3500rpm and the engine feels more "urgent", like it's waiting for you to unleash it. When you do, it slingshots you forward. I'm pulling taller gearing (up 1 tooth front/down 1 tooth rear) but even so, 100 mph comes up quick. Backing down to 80, I can maintain the "Eco" light at this speed and keep it in closed loop for better mileage. I averaged close to 50 mpg on the trip. 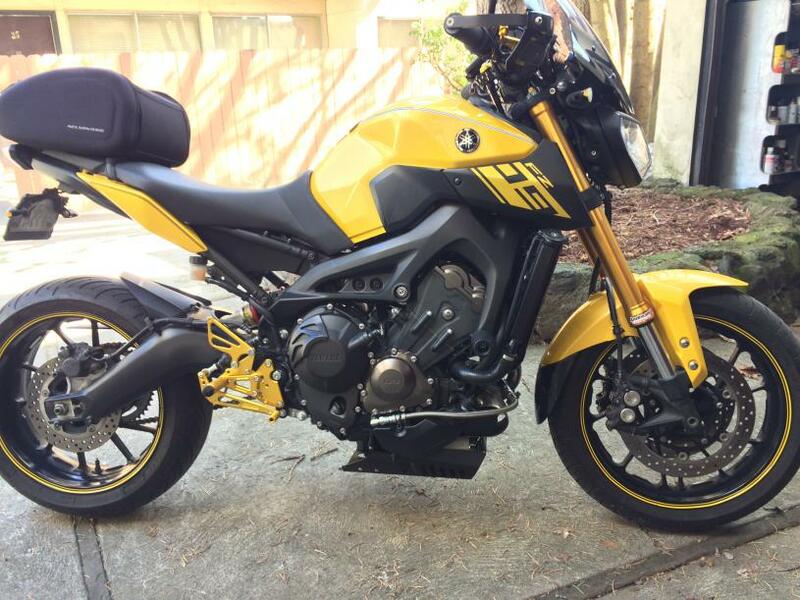 At first I was considering taking it to Seattle for a Two-Wheel Dynoworks tune w/ecu reflash, but now I'm thinking about just taking it to a couple of local shops who are trained on Dynojet 250i operation and tune it myself by simply changing the Dobeck buttons. All I'm concerned with is making sure the A/F ratio stays around 13.5:1. The graph is a bonus and I'm also curious about the actual numbers to see if it matches what I'm feeling. I decided to take the air box apart and inspect things. Everything was normal, but while in there I cleaned the K&N filter, but purposely omitted spraying the oil. I did the same for the K&N on the turbo suction (intake air actually gets filtered twice). It made a noticeable difference as boost comes in earlier and with more ferocity now. I'll oil the turbo inlet filter next summer when atmospheric dust levels rise, just to be safe. That filter is easily accessible. BTW, I bought an extra turbo unit when I started my build just in case of problems. But it is still in the box and would sell and ship it to anyone who wants to do a winter project similarly like I did. You started this thread in January and haven't bothered to get it on a dyno for some actual numbers or check the AF ? Nobody can doubt the dependability of this motor. Last edited by Cw09; 11-08-2018 at 05:54 AM. For sure, this motor is amazing as you've also confirmed with your drag race performance. 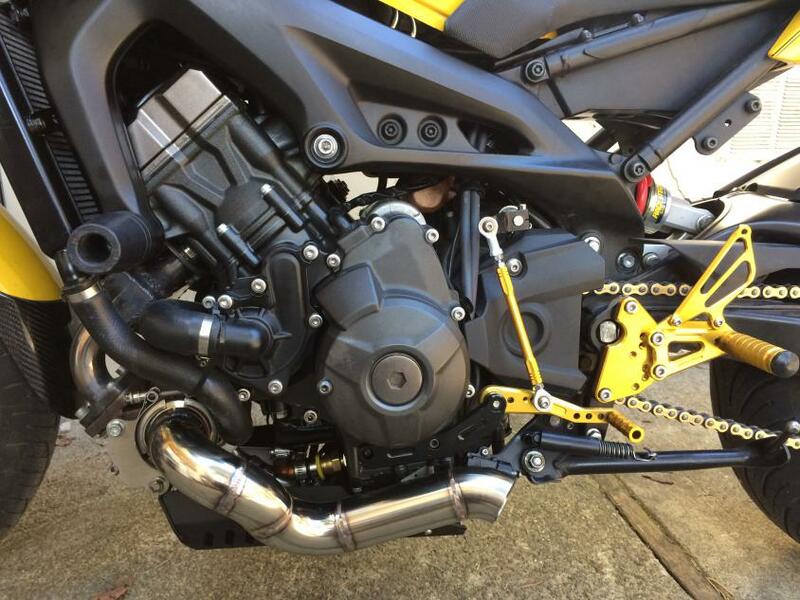 I rarely go above 5 psi boost, which gives it MT-10 performance, but am obviously curious about what it would ultimately do on a dyno. The goal of the build was to install a simple light-weight turbo at the front of the engine for better handling and it worked. Fueling was done by the guy who founded Dynojet, Mark Dobeck. 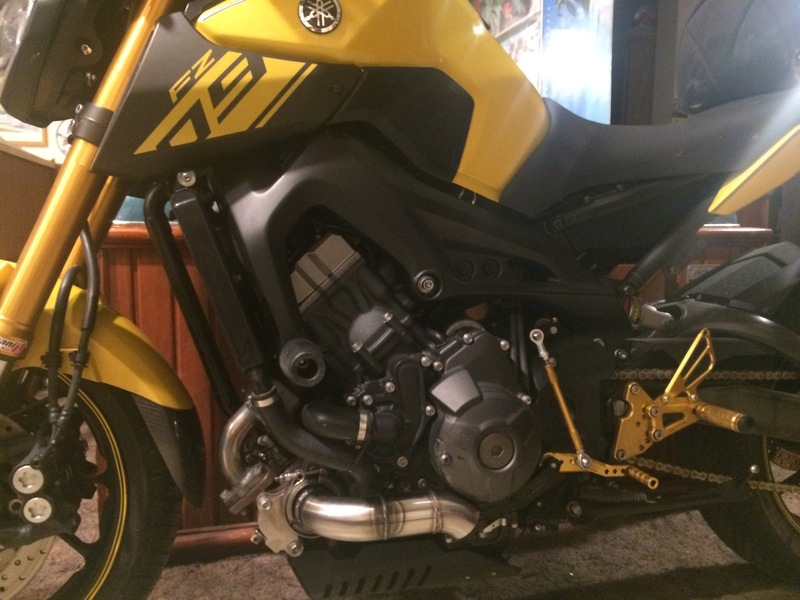 If I were to do anything else, it would be to ride over to his shop in Montana and have him develop a 4.0 series kit with a wide-band O2 analyzer, then contact Yamaha to see if they would consider a Yamaha Factory Turbo Kit for the Neken which obviously needs something to push along that extra 150 lbs. of weight.